I recently spent a fabulous week holidaying in Ibiza, the week consisted mainly of lounging by the pool, the waterpark and a few brilliant day trips out and of course visits to the beach. I know it is known as the party capital of the world but seriously there is so much more to Ibiza than just the club scene. If you haven't been I highly recommend making a visit. 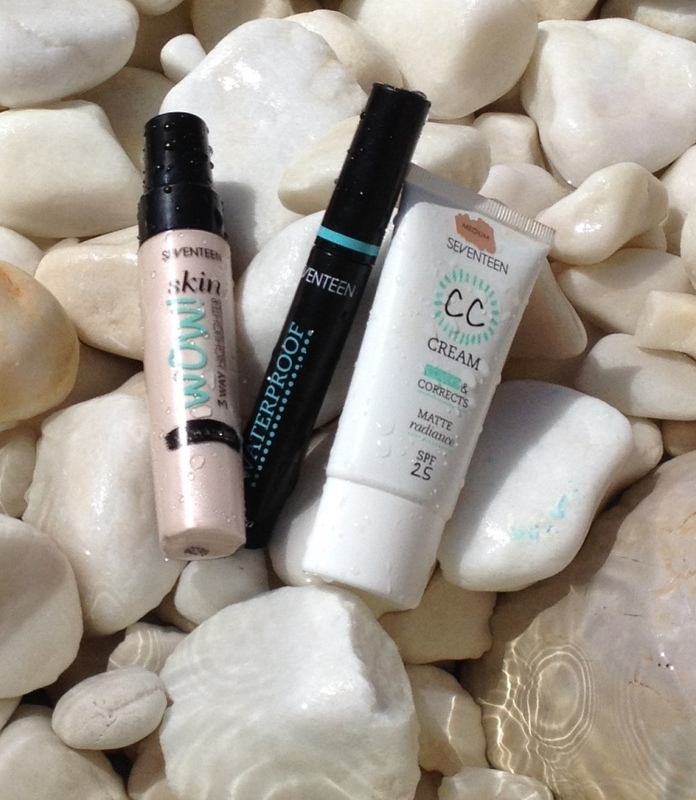 During the day by the pool I like to keep things simple (I have a son aged 7 and we spend A LOT of time in the pool!) 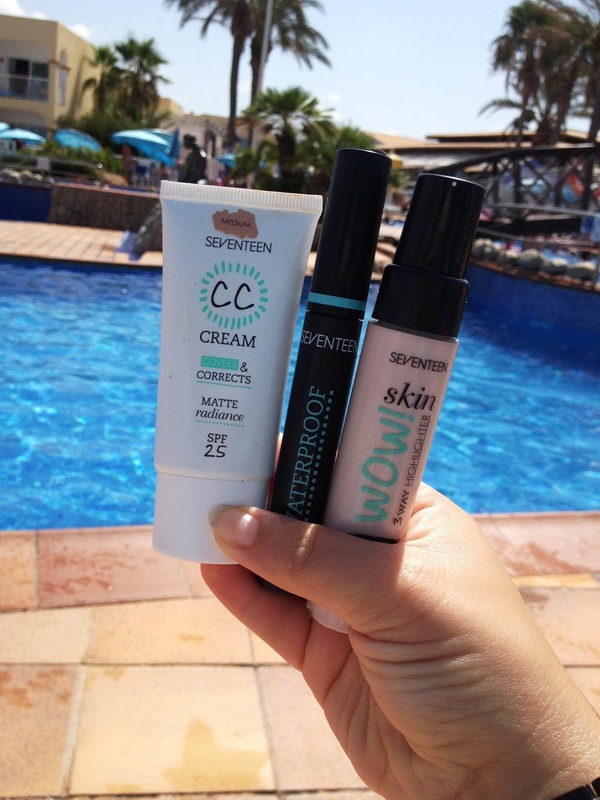 so I just went with my really high sun protection, a light coverage of the SEVENTEEN CC Cream which has SPF25 to just even out my skintone and hide those pesky blemishes.. I must say this CC Cream is a fantastic product, a little went a long way and it was the perfect shade for me (medium) but more on this in my next post - Holiday Makeup For Evening. I also opted for some highlighting magic from the SEVENTEEN Skin Wow Primer, this gave a beautiful dewy and super healthy appearance to my skin. Described as a 3 way HIGHLIGHTER GLOW & PRIMER, I used it all three ways and loved the way it lit up my skin, blended well so that its cool tone looked completely natural and just gave a wonderful glow and all round pick me up. The biggest leap of faith by far was the SEVENTEEN Waterproof Mascara which promised the following - Both waterproof and smudge resistant this non clogging mascara lengthens lashes and lasts all day. As I mentioned, I spent a lot of time in the pool and we also had an adjacent water park that featured a HUGE bucket that tips its entire contents of water on to you if you stand under it. My son thought this was hilarious and made me stand directly under it, the cheeky thing! So was the waterproof mascara up for the water challenge? I can confidently give this a massive thumbs up and resounding yes. It passed the water test with flying colours. Only the teeniest tiniest of smudging and no panda eyes in sight. I wore this mascara all day everyday. As a waterproof mascara this gave great definition and length to my lashes, was light and the formula wasn't thick or gloopy.